A wild whitetail buck with a gross Boone & Crockett score of 190 inches is a freak of nature. Even in areas known for big deer, the average hunter will never see such a beast on the hoof, much less shoot one. Tagging a 190, or even finding one of his sheds, is a statistical anomaly. So imagine being a bowhunter with only one archery buck to your name, and then arrowing a buck that scores over 190 — counting just one side of his rack. As detailed in our exclusive cover story in the Spring 2019 issue of North American Whitetail magazine, last November Luke Brewster achieved that shocking feat in Edgar County, Illinois. 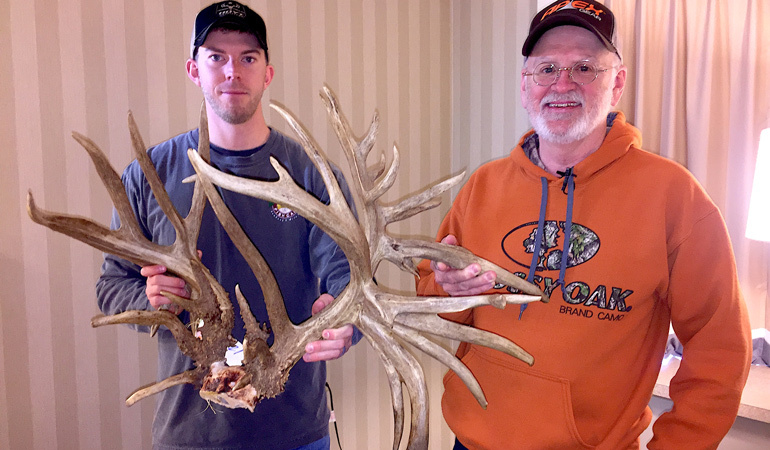 Due largely to a 191 2/8-inch left antler, after the 60-day drying period official measurer Tim Walmsley gave this giant a gross B&C score of 330 0/8 inches and a net of 320 5/8. Assuming it’s upheld by a measuring panel, that score will annihilate the current Pope & Young Club archery world record of 294 0/8, held by Ohio’s Mike Beatty since 2000. It even would trump the 312 0/8-inch muzzleloader buck Stephen Tucker shot in Tennessee in 2016. That would make Luke’s 38-pointer the world’s top wild buck ever taken by a hunter. The overall B&C world record officially belongs to the “Missouri Monarch,” a 44-pointer found dead near St. Louis in 1981. He has a net score of 333 7/8. At No. 2, netting 328 2/8, is the “Hole in the Horn” buck, a 45-pointer found dead in northeastern Ohio in 1940. 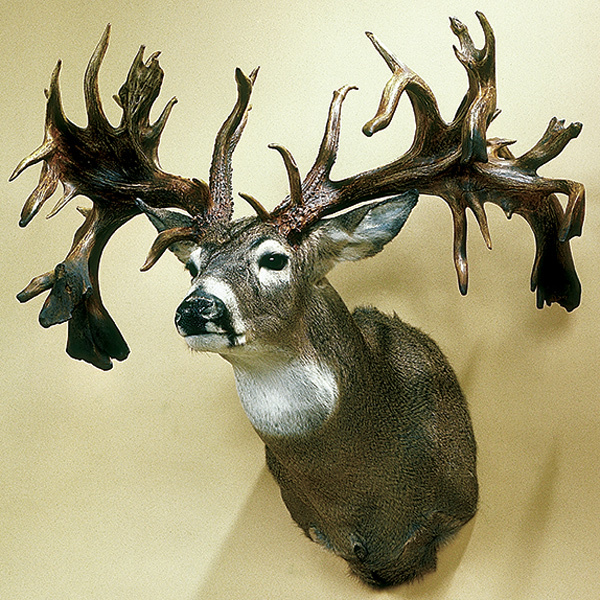 Following panel scoring, the Brewster buck presumably will slide into the all-time No. 3 slot behind that legend. So even before the story of Luke’s historic hunt comes to light, the buck’s measurements are well worth studying. Because they reveal a trophy that in one way stands apart from all others. Let’s start with the “smaller” side of the rack. 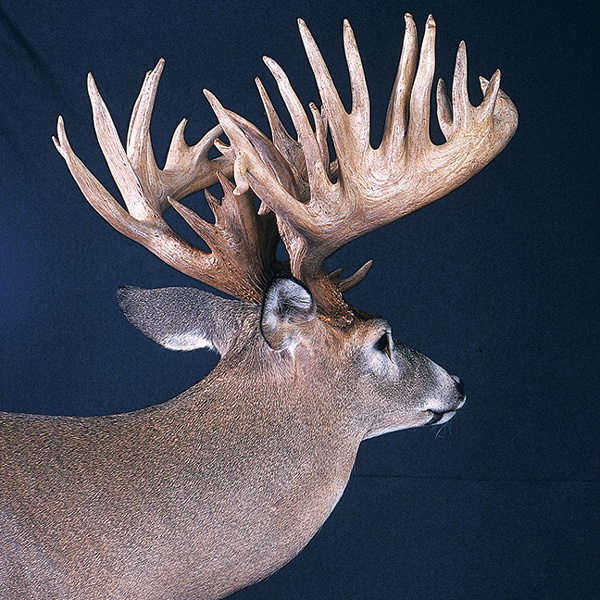 The right antler is scored as a 3-point typical, with that frame grossing 68 5/8 inches. The nine non-typical points (the longest a 10 2/8-inch drop tine) add 49 7/8 inches, totaling 118 4/8. Now, that’s nothing to scoff at; doubling it and adding the buck’s inside spread of 20 2/8 would yield a gross score of 257 2/8. Even that number would put him among the top bow bucks in Illinois history, as well as one of 2018’s best from anywhere — bow or gun. The Brewster buck’s 26-point left antler is what truly launches him into the stratosphere. It has a 62 6/8-inch 4-point typical frame, plus 22 non-typical points ranging from 1 1/8 to 12 7/8 inches. These abnormals total an unprecedented 128 4/8 inches, bringing the left antler’s gross score to 191 2/8. That number makes it the highest-scoring wild whitetail antler ever, from anywhere in the known universe. Officially, the record for a single side off a wild buck is 180 0/8 inches. It was worn in late 1989 and early ‘90 by a massive giant known as the “Minnesota Monarch.” That right antler has a typical score of 87 7/8 to go with 92 1/8 inches of non-typical growth. The gross total of 180 0/8 makes it the all-time No. 1 non-typical whitetail antler documented by the North American Shed Hunters Club. Interestingly, the North Woods behemoth never was taken by a hunter, and his ultimate fate remains unknown. 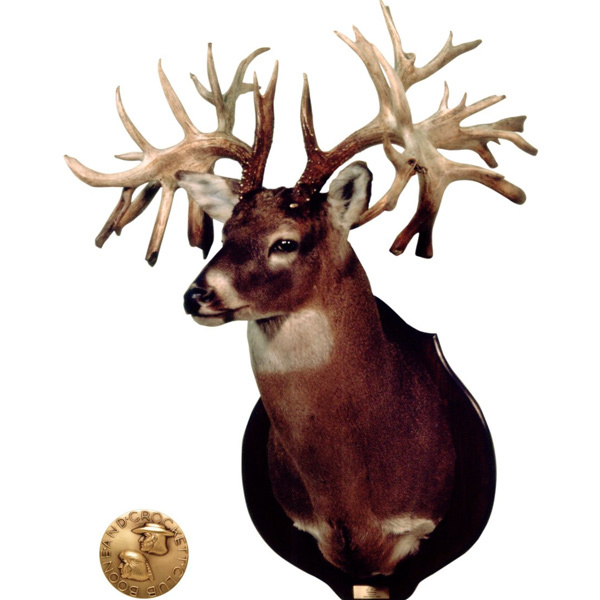 Neither the Missouri Monarch nor the Hole in the Horn buck comes close to matching the Brewster buck on either side. The Monarch’s right side is 160 4/8 inches (94 2/8 of it abnormal), the left 156 1/8 (89 6/8 abnormal). Adding an inside spread of 23 3/8 brings the rack’s gross score to 340 0/8 before asymmetry reduces it to 333 7/8. For the Hole in the Horn, the right antler grosses 170 2/8 (100 4/8 abnormal), the left 149 2/8 (92 3/8 abnormal). An inside spread of 24 3/8 pushes his gross to 343 7/8: highest ever recorded for a wild whitetail. The total of 15 5/8 inches of frame asymmetry drops the Ohio legend’s final score to 328 2/8. While the Brewster buck’s left antler obviously isn’t a shed, let’s compare it to some of the best singles on record for other North American big game. If the Illinois antler had been grown by a non-typical American elk instead, it would currently tie for No. 26 among unmatched singles in that category. It would be just 26 5/8 inches under No. 1. In addition, the antler would handily outscore the continent’s top single Roosevelt and tule elk single sheds in the NASCHC records — and the largest single barren ground caribou shed. That’s how big 191 2/8 inches really is. What caused such an explosion of growth on the Brewster buck in 2018? We can’t be certain. We do know live images from prior years show the rack wasn’t nearly as big or freaky then as in the weeks leading up to Luke’s epic 2018 bowhunt for the 7 1/2-year-old monster. Nor had the buck broken off much antler prior to walking into bow range of the Virginian. So in every way, Luke’s Nov. 2 encounter with the buck was perfectly timed to make history. Despite the tremendous P&Y trophy output of states such as Iowa, Kansas, Wisconsin and Ohio, the Brewster buck is on the threshold of giving Illinois an unprecedented sweep of the vertical bow world records. The legendary Mel Johnson buck, taken by recurve in 1965, still holds the typical mark at 204 4/8. And let’s not forget that Illinois also boasts the non-typical record for crossbow: Jerry Bryant’s 304 3/8-incher from 2001. The Brewster buck will make Illinois the only state to boast a pair of wild whitetails officially netting 300-plus — and both fell to hunters. Of course, when panel measurers confirm the score of Luke’s trophy, they could change one or more of the measurements. The final tally thus could go up or down. But no measuring tape can change what’s on the head of any big-game animal. Regardless of the final numbers, this beast is already a legend.